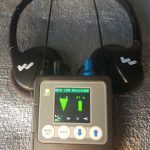 I’ve spent the last few months putting Lectrosonics’s latest IEM/IFB system, called the Duet, through the paces here on my current show. The system is hands-down the BEST sounding in-ear monitor I’ve ever come across. It has a very good range in our studio and is nearly impervious to an incredible amount of wireless signals that are being used on our set. It is fully digital, scalable and it’s also one of the most configurable and flexible cart-based systems on the market. The transmitter is 1RU tall and the width is ½ of a rack. Each transmitter comes with a hardware kit that covers half of what is needed to rack mount two units together as 1RU. There is also a kit available for mounting one M2T in a single rack-space. It boasts a large screen with easy to read, logically laid out status information. It has four levels of brightness control. 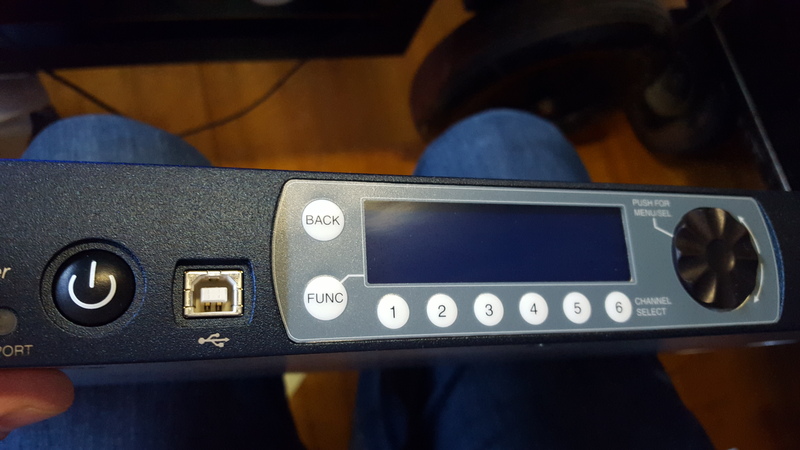 In addition, the front panel layout has a headphone jack & volume control, Menu/Select & Back buttons, factory reset button, four channel buttons, menu navigation up/down buttons, USB Port, IR Port and power switch. 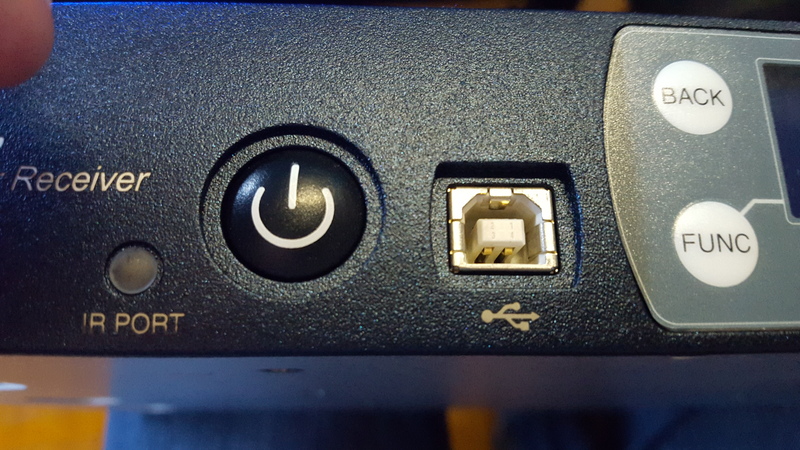 The USB port is for updates and connectivity to Wireless Designer. 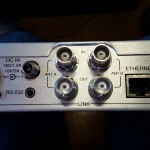 The IR Port is for transferring settings to the M2R Receiver (including frequency, name, limiter, mix mode, etc).There are also plugs that can be easily removed to have external antennas front mounted on either side of the front panel if mounting a single M2T with the optional rack kit. 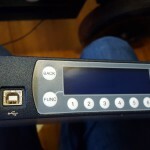 The rear panel has two antenna output BNC connectors, power jack, dual Dante ports, four XLR/TRS inputs and an ethernet port for use with Wireless Designer. 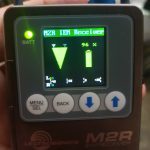 The transmission system is fully digital, and not a hybrid like some other Lectrosonics products. It has two separate transmitter carriers that each contain two audio signals. I’ll talk more about the advantages later in the review. 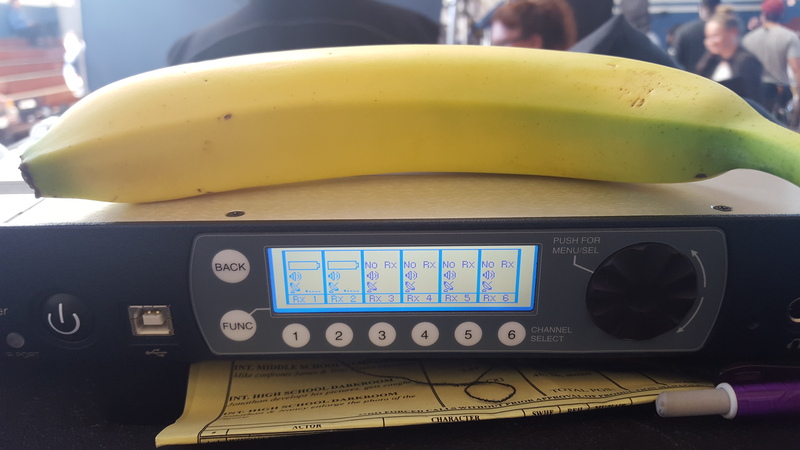 In addition to the four different analog inputs, the M2T features full Dante Connectivity – which means if you are running Dante, you can easily route ANY channel to the transmitter using Dante Controller via your computer. The menu system is logically laid out. 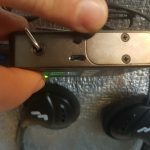 You can adjust the Audio Level/Trim, Audio Input > XLR1-4 and Digital (Dante), Polarity, Custom Headphone monitoring setups, Brightness, Panel Lock, and editing of the names for tracks, signals and the individual M2R’s name. With the Duet System, you can also set up a “FlexList” for creating up to 16 user profiles to quickly access your personal mixes on any of the receivers. The Duet system is wide-band and runs 470-608 Mhz for the US version, and 470-614 MHz for the export version. 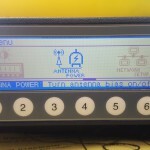 Both versions of the transmitter offer RF power output settings at 10, 25 or 50 mW. The M2R is enclosed in a very solid milled aluminum case with the Lectrosonics “EbNi” finish – just like the current LT & SM series. 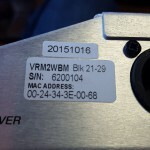 The front of the M2R has a easy to read, square 1” x 1” screen. By default, it shows Name, signal strength & antenna diversity status, battery level percentage and audio levels (L & R). Under the screen there are four buttons: Menu/Select, Back, Up and Down. To the left of the screen is a battery LED showing battery strength (Green, Yellow & Red). This is useful when the screen backlight is set up to sleep after 30 seconds. 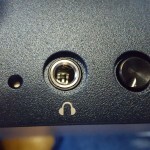 The top of the unit has two fixed antennas, on/off & volume control pot, IR port, headphone jack and RF Link status LED. The left side has the battery door (dual AA). The right side has a USB port. There is a socket on the left and right side for mounting the wire belt clip. The rear has the model number / serial number plate and the battery installation guide. The M2R menu system is feature rich, especially compared to most currently used systems on sets. 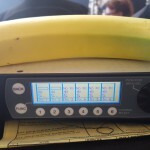 From the menu, you can do Frequency Scans, access FlexLists, Frequency, L/R Balance adjustment, Mixer Mode (choosing a given audio output to L/R/Mono), Limiter functions, HF Boost, Meter Mode, Clear Scan Data, Backlight Level, Battery Type, Lock Settings and set the Compatibility Mode (Duet Digital or FM IFB). 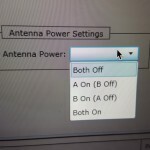 The Duet system is limited to a 50mw transmission. Even so, we get a range that easily covers our entire large studio floor. This is considering that the amount of other wireless devices on our set is more than I’ve ever seen – by a large factor. In fact, we’re using a Clearcom Freespeak II system that sends up to 32 channels of audio out to the comms systems of our puppeteers. We tried the most common forms of IEM/IFB being used (Lectrosonics R1As, Comtek 216s and Sennheiser G3s) next to the Freespeak II transmitters. In each case the receiver got a nasty proximity buzzing sound… all except for the M2R, which was ROCK SOLID right up against the Freespeak II transmitter. Using Eneloop Pro rechargeable batteries, we easily made it to lunch (6+ hours), especially with the backlight set to 30 seconds of on-time before sleep. [UPDATE] I’ve gotten reports from another crew who are using the Duet System with Energizer AA Lithiums. They’ve been getting a full day on one set of batteries. Good news! The Duet system is ideal for use as a PL and IFB for Boom Operators. 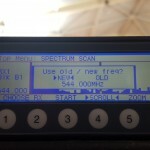 A BoomOp has the independent ability to switch between Program Mix and Boom ISO Mix using the Mixer or Flexlist menu. The system is also ideal for directors and executives. Keep in mind, the menu controls can be locked in the menu. 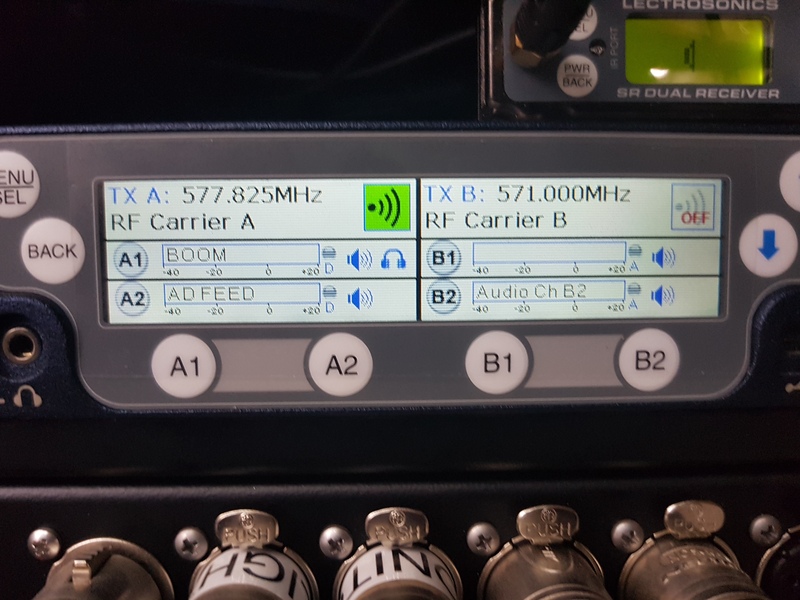 1: BoomOp IFB/PL – Our Boom Operators can switch between a Program Mix/Private Line Feed and an Isolated Boom Feed/Private Line Feed at a couple of button presses. The ability to use an isolated feed is great for finding noises and checking for strange reflections / phase issues. 2: Director’s Comms / PL to Puppeteers – Our director is also operating a steadicam. 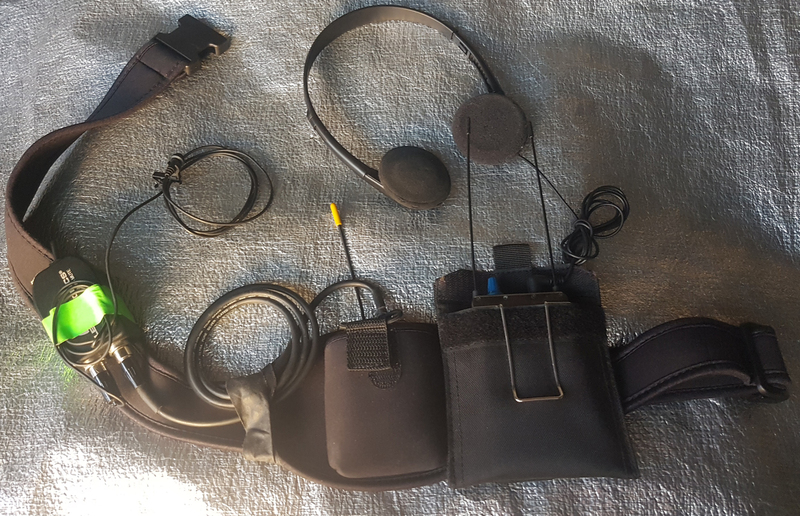 We have a belt worn Comm/PL kit that consists of a M2R receiving a custom mix (Program + Performers). We are using a Lectro SMV with a Lectro Mute Switch (Referee-style) and lavalier so the director can then give instructions directly into the comm system to our puppeteers. 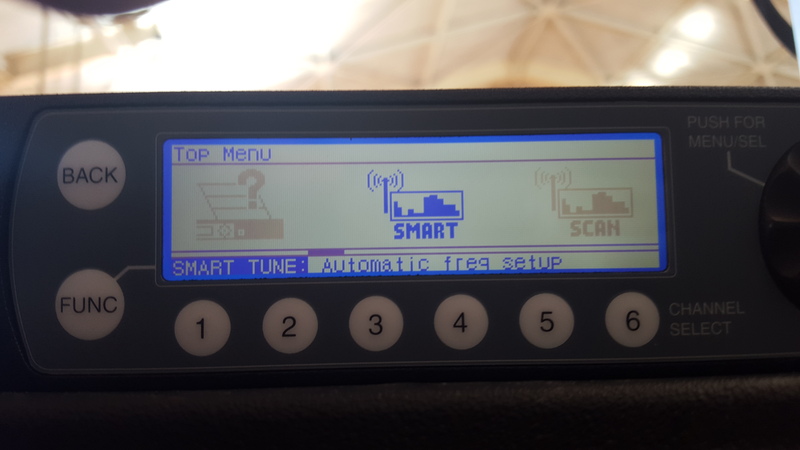 •Only a cart-based transmitter is available currently. There is a plan for a bag transmitter in the near future, but no definitive date set. •We’ve had the blue volume control knob come loose over time. No worries, just keep a 0.5mm hex wrench on hand and give it a good tighten now and then. We are going to a two set screw volume knob on future M2R’s in place of the current single set screw. We mill the volume control knob out of aluminum. The mill doesn’t care if it has to spend 5 seconds more tapping in a second hole at 120 degrees from the first one. A second set screw causes the knob to have three contact points on the control shaft; the two set screws plus the side opposite the set screws. This three contact setup is a dozen times more stable than a single set screw since tripods don’t wobble. If you have one of the single set screw units, I’m sure Lectro will send you a replacement knob at NC. You all have better things to do than re-tighten set screws. The Duet is a powerful system offering crystal clear audio, great range and high RF immunity. 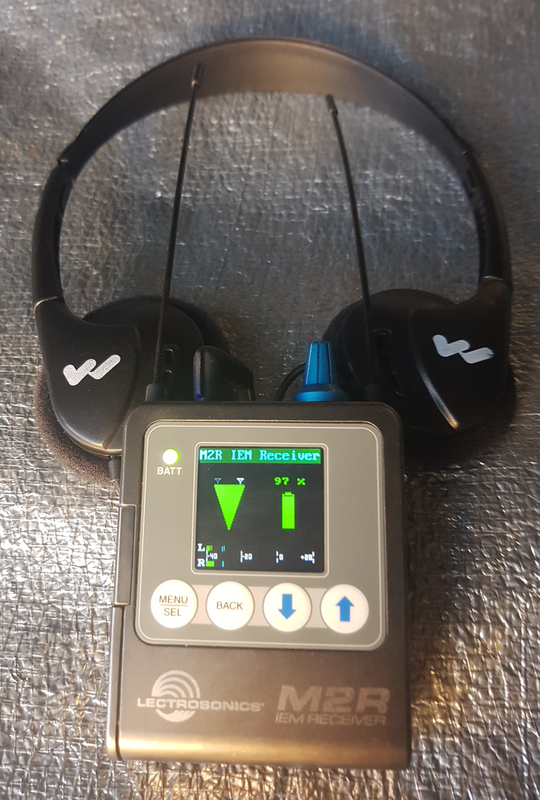 Along with it’s amazing routing options and also coupled with full Dante connectivity, the Lectrosonics Duet IEM Monitoring System is a prime choice for on set use. 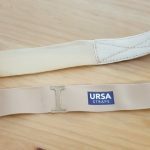 URSA Strap – A better mousetrap aka THIGHstrap! I’ve recently had the chance to play with the full line of URSA straps. Let me bluntly say that they are a total gamechanger in the world of wireless bodypack straps. They are thinner, more breathable and simply better built. 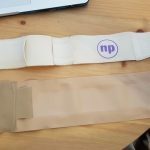 They also have some ingenious design features that take them leaps and bounds above the existing market leader in straps, Neopax. 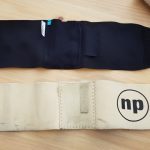 Material – The URSA strap is a 1 mm thick fabric that is much thinner than NP, yet still feels strong and stretchy. 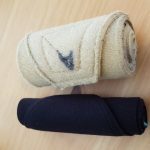 It can be easier to hide and is much more breathable. Costume department members and actors will be fans! They also take up a lot less space in the kit, which is an added bonus! 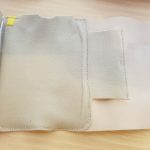 Pouch – The pouch is sewed together with a much higher quality stitch than the Neopax, which, in my experience, are sometimes prone to come apart. 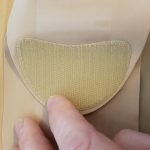 Each ankle and thigh strap have an oval of nonslip gripper inside the pouch to keep the transmitter securely in place. 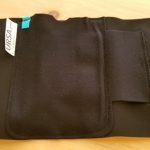 URSA Pouch Protector straps are also available for absolute security. 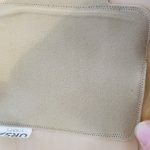 Nonslip – Ever had an actress hiking and pulling up her thigh strap over and over in between takes? 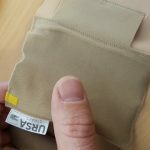 Well URSA has applied the same nonslip strip in each pouch on the thigh strap which highly minimizes / eliminates the issue. Again, happy actors and costumers is a good thing! 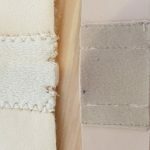 Velcro Alignment – The velcro on the URSA strap is curved and also doesn’t go edge to edge. This, again, is for actor comfort. And it also won’t threaten to ruin a pair of tights like the Neopax thigh straps, which have velcro from edge to edge, have in the past. 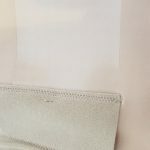 The curved velcro also can be helpful to blend in under wardrobe without the stark lines that can telegraph through wardrobe like with the Neopax. 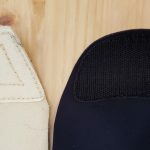 The velcro on the thigh strap is also of a lower profile to further reduce possible snagging and bunching up. 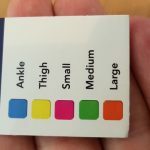 Color Coded Identification – Again, a simple design idea that allows for easy identification of which strap is which. The color also quickly identifies the pouch’s top side orientation. 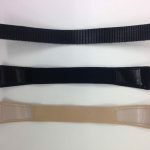 Strap Colors – URSA comes in three colors: Beige, Brown and Black. Brown is a welcome addition for our darker skinned actors. 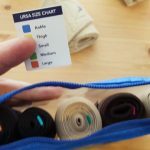 Strap / Pouch Sizes – The URSAs come in five sizes: Ankle, thigh and waist (small, medium & large). Each strap also has two pouch sizes available to accommodate smaller and larger transmitters. 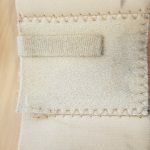 Chest Strap – Chest straps have always been a difficult beast. I’ve never come across one that really worked. They’d slip, be visible under wardrobe and cable management was difficult. URSA’s Chest Strap manages all of these problems. Like the rest of the line, it is extremely thin for hidability. 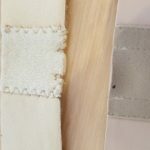 Similar to the thigh straps, it has the non-slip strips to keep the strap in place. And it incorporates cable management guides along the strap to guide the microphone cable in place under the strap. 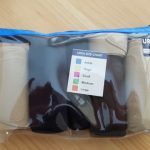 URSA Case – URSA also has a nice clear pouch available to keep your straps together in a neat orderly package along with the color-coded identification chart. Availability – Until recently, you couldn’t get URSA Straps in the US, but I’m hearing reports that the hurdle has been overcome with some design changes and you should be seeing them in stock around April or May of this year! All in all, I think URSA is going take over the market for its segment of the production sound world. I for one, will be using them exclusively from now on! I was very humbled to receive a CAS Award Nomination for Stranger Things. I don’t expect to win the category, but I am very honored to have worked on such a great show, with some of the best cast and crew I’ve ever worked on. I’m also awestruck to be in the category with some of my favorite shows of the year, namely Westworld, Game of Thrones, Better Call Saul and Mr. Robot and their respective sound mixers. I’ve been playing with a new pre-release version of the Orcabags OR-32 I got from the Orca bags R&D team. I built directly out of my version 1 OR-32 and I must say, I am VERY impressed with the myriad of updates! The bag retains all of the features I really liked, like bag rigidity, accessibility and quality construction. 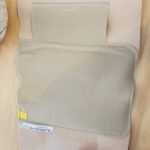 The updated bag has addressed some early issues that I had with the OR-32, (even as serviceable and robust as it was) and dealt with ever single issue and adding some nuances and user upgrades along the way! Main TPU Loops have been moved to the frame – This means no more drooping sides when clipping cables and accessories to the bag. All small snaps have been converted to Velcro connections. Rain flap Velcro has also been added in lieu of snaps when rain flap is in use. 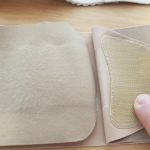 Finally, the flap has an addition of velcro so that it can roll up into itself and stay shut. Both zippered side access points have been converted to a larger and more accessible oval opening with extra zipper heads. 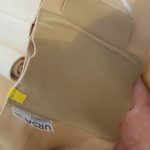 Side Removable accessory pouches also lose their snaps in favor of Velcro connections. 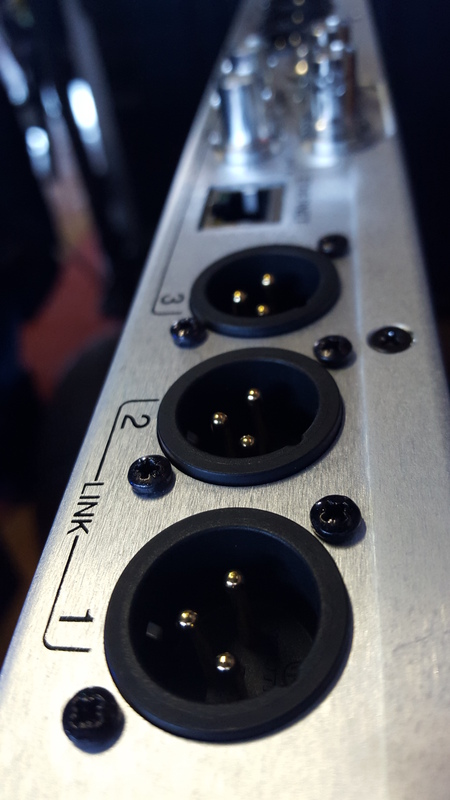 Extra Zipper Heads on all four corners allow for more cable management options. 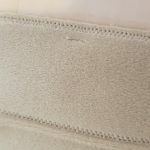 Pull tabs at velcro connections allow for easier opening of bag sides. At the top front pocket they are two Velcro straps to hold a boom pole / protector. Great addition! I also wanted to confirm that CF & SD cards and 1/8” Headphones input are accessible on Sound Devices 688 when mounted properly. I used some zip ties to really lock it in after leveling with the OrcaLift mounts. Cheers Orcabags on a great revision of a great product! As we know, there is no one “perfect” microphone that fits all scenarios. Sound can get pushed out in a wide/tight… sometimes a space is more reverberant than we’d like… or background noise can be an issue. There are different issues that we have to deal with on set and each microphone fits a given need for certain situations. Previously, we felt our “arsenal” of microphones was adequate and ample. We have mics that we like inside and outside, for use in live spaces, lower sensitivities, looser/tighter frames & importantly, matched sets. 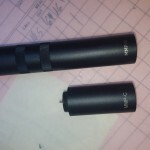 Well, we had the chance to add in a full spread of DPA microphones to our list. We were quite pleased with the additions. We’d commonly use the CMIT for exteriors and the MKH-50 for the majority of our interior work. The 641 would come into play in tight closeups, reverberant rooms and as a versatile plant mic. The 641 also got some play with the GVC swivel for a lower profile when we were in situations with tight headroom or walking through doorways on walk-and-talks. In October, we had to send a Schoeps CMIT5u back to Germany (which takes time) to get it checked out for an occasional ticking sound while using it wirelessly. I ended up buying my first DPA 4017B to use as a temporary replacement. We liked it… a lot. 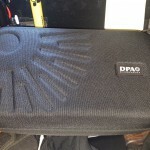 We’ve had the DPA gear mixed in with our pre-existing kit for about 3 months now. We’ve slowly integrated it into our workflow. It can take some time to become confident with microphone choices on the fly in the quick-paced environment that we work in. Over that time, we’ve learned about the DPA microphones and have come to rely them as essential parts of our kit. Schoeps microphones sound great. We love the rich sound of the CMC641 up close and we also love the range and punch of a CMIT5u, even from five feet away on an exterior wide. They almost can’t be beat. Schoeps owners love them… until the occasional humidity flutter hits the CMC series. 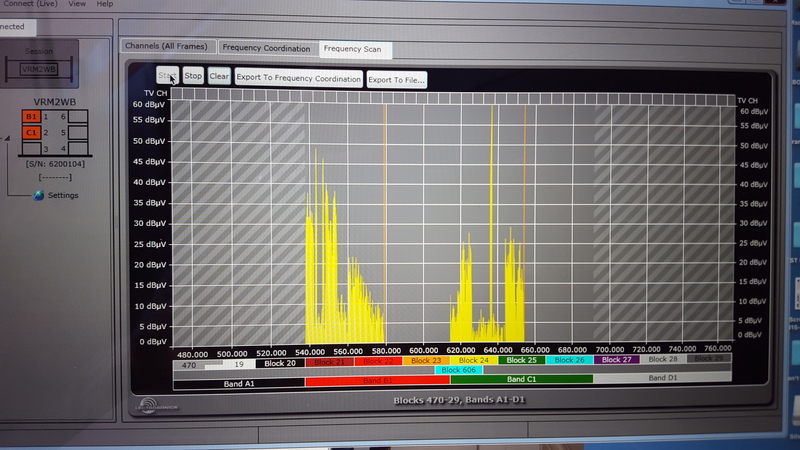 Or the occasional RF “tick” we sometimes experience while running a wireless boom with the CMIT. Now, it doesn’t happen very often, but when it does, you have no choice but to go to another microphone. In three months, we’ve really enjoyed the clean, crisp sound of our DPAs. We’ve also experienced no RF problems or humidity issues. We are going to keep our ears out as we get into the warmer, wetter months ahead, but we’ve also talked to other DPA users and they tell us that it has not been an issue. Much like the Schoeps CMC series, the DPA line is totally modular. You can switch from a 4017 capsule to a 4018 using the same preamp in the time that it takes you to unscrew and re-screw in the desired capsule. That means you can switch from a shotgun to a supercardioid using the same preamp. The DPA 4017 shotgun has a fantastic reach and a great, full sound. It compares very similarly to a CMIT in an exterior wide. The DPA is a great microphone, especially when you consider the lower price, the modularity and RF immunity when compared to the CMIT. The DPA 4018 supercardioid has become one of my favorite microphones for interior use on the boom. It fills a gap I wasn’t really aware that I had in my microphone package. Typically we’d use the MKH50 for medium work and go to a 641 for closeup work (when we could). Now we use the 4018 for medium and closeup work to great result. In certain situations, the 4018’s reach was not quite as deep as that of our MHK50, but the 4018C gives us a lower profile option for walk-and-talks through doorways that used to demand the CMC641 with the GVC swivel. When pushed to a medium shot, the 4018 just packs more punch than the 41 and with a smaller profile than the MKH50. Shooting a scene in a reflective bathroom on a medium/tight lens? The 4018 delivers a great sound while reducing some of the effects of the reverberant space similar to the 641, but with more “bite” when at a higher headroom. As DPA is very exacting to get an almost identical flat frequency responses from all their different microphones, including lavalieres. Because of this, the DPA products we’ve tested seem to mix exceptionally well together. 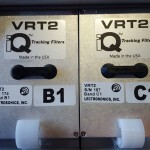 The main differences between the two preamps are size and the filter options. The B is the larger of the two and has both a low frequency roll-off filter and a high boost filter switch built-in. 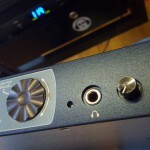 The C preamp is about 2 ½ times smaller in length than the B preamp. 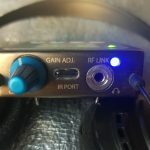 The B preamp weighs just a bit more than the C, but not by much: 1.48g vs 1.45g. If you have a DPA that needs service or repair, there is a service center in the USA. Telephone support is also available. 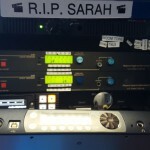 Sennheiser also offers a USA service center and support. 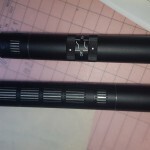 Schoeps offers top-notch USA support through Redding Audio, but any microphone service must be sent to Germany. We’d like to see a slightly denser foam option for both the 4017 & 4018. The current offerings are not quite as wind-resistant as the windscreens that come with our Schoeps & Sennheiser microphones. That said, this is only noticeable when doing quick interior cueing and is a minor issue. The 4017B comes with a nice case that can hold other DPA accessories too. Prices are all in the same ballpark with the CMIT on the high end and the MKH50 on the low end. Many will find the 4017 to be a bargain at $400 less than the CMIT. I think the reach on the 4018 is well worth the additional $90 when compared to the CMC641. We’re extremely happy with the DPA offerings. They have definitely helped to make our work sound better. We even have a new “go-to” microphone for medium and close-up interiors, the 4018. Kudos DPA! Next up > Chapter 2: Battle of the Plants! 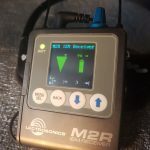 I’ve recently had the pleasure of using the new Lectrosonics Venue 2. It’s such a huge improvement over the original Venue; something our industry already considers the proven modular workhorse. 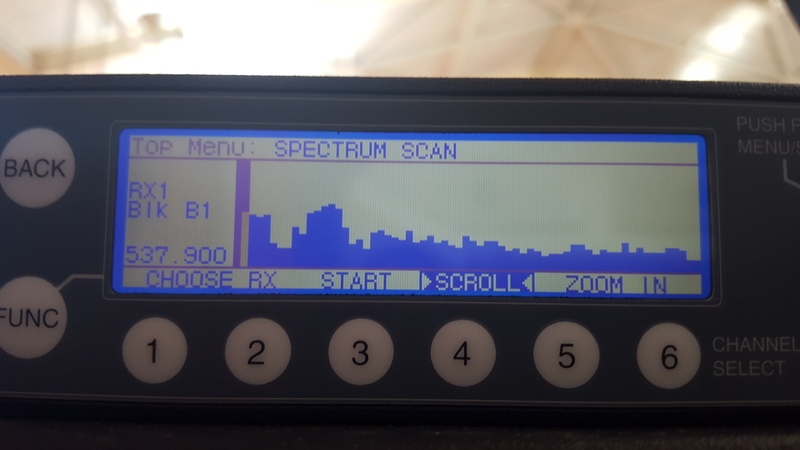 With new features such as wide-band blocks, IQ filtering, lowered noise floor, Wireless Designer with built-in frequency coordination and—one of my favorite features—menu-driven antenna power toggling, you can be sure to see the Venue 2 on sound mixer’s carts all over the world soon enough! The Venue and Venue 2 share many core similarities. Each can handle six wireless modules which can be installed without tools. Both have a built-in RF multi-coupler with loop-thru output to gang multiple units together through a common pair of antennas. 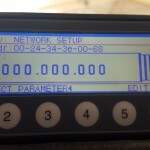 Phantom power is available to run remote powered antennas. 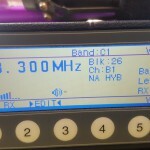 They are also both available in Wideband Low (470 – 691 MHz) and Wideband Mid (537 – 768 MHz). For the most part, every feature from the Venue has been carried over and/or improved in the new Venue 2. The front face on the new V2 is a flush surface with membrane buttons, a welcome change. It also sports a new non-glare flush-mount LCD that has brightness options and can display more information. 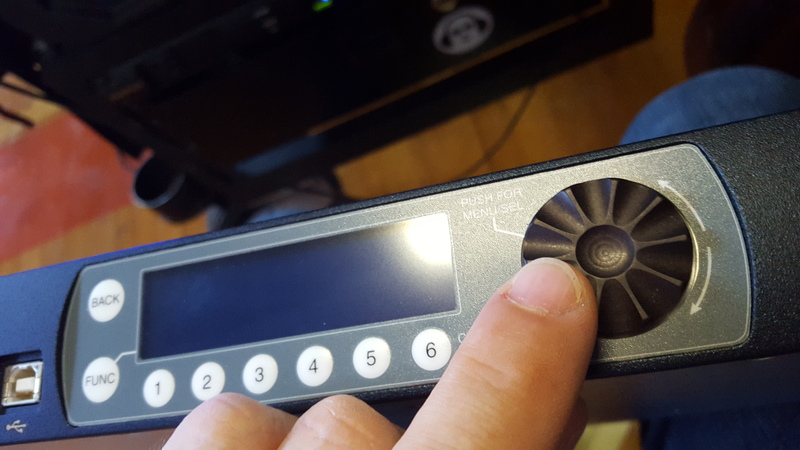 The selector dial is now a larger wheel. 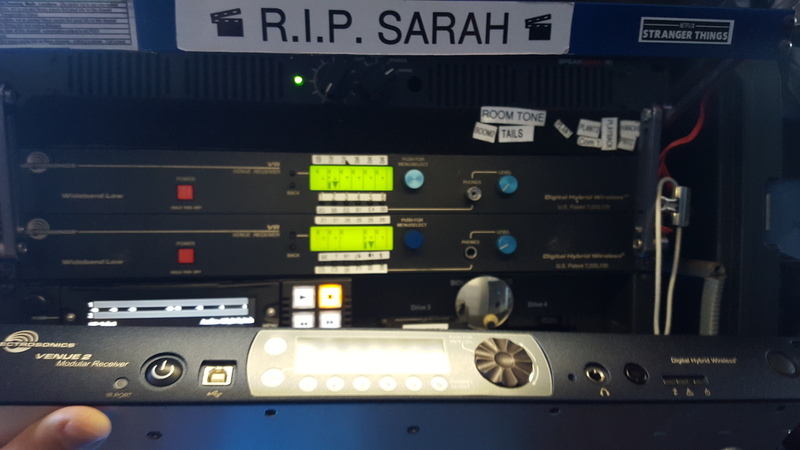 New additions to the face include: Alert indicators, an IR port (for programming newer style transmitters), a USB connectivity port and a recessed reset switch. 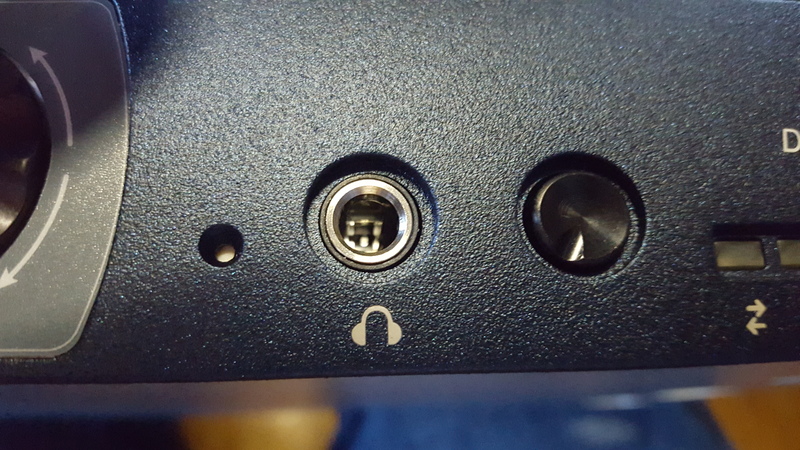 The headphone knob is now a push to open/close knob. 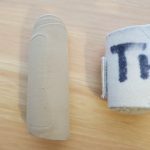 Also of note: There are two rubber caps on either side of the face that allow BNCs to be rerouted from the back to the front of the venue. The V2 rear panel has all of the same elements of the original V1 with a singular and powerful addition: the ethernet port. The BNC ports have been rearranged into an over/under rather the the V1’s side by side layout. Existing V1 users will be at home with the design of the V2. Modules are loaded in the same way and locked into place with clips, just like the V1. 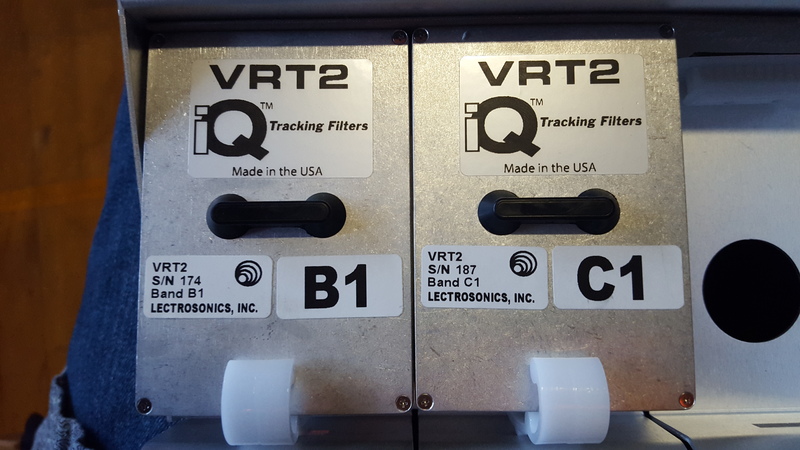 The new VRT2s are now wide band. They allow tuning between three consecutive blocks with 3072 tunable frequencies in each module called Bands. A1, covering blocks 470, 19 and 20 (470.100 – 537.575 MHz), B1, covering blocks 21, 22 and 23, (537.600 – 614.375 MHz), C1, covering blocks 24, 25 and 26 (614.400 – 691.175 MHz). Please note: older VRTs and VRSs are not compatible with the new V2. “Considerable time was spent in engineering on the diversity circuit and algorithms for the Venue 2. First, how often the phase switching takes place was reduced. 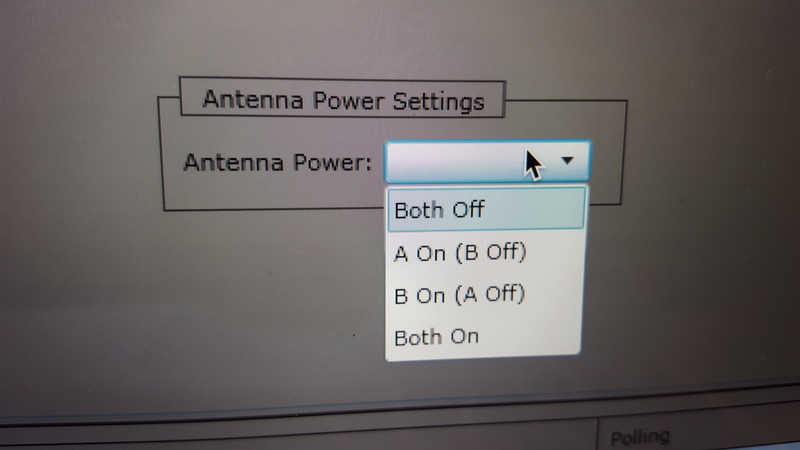 In the older systems, this switching is more aggressive, meaning that even with fairly strong signals, the phase of the 2nd antenna can still tend to switch. 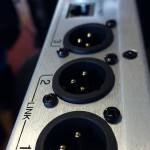 With the Venue 2, this switching is minimized to when it is absolutely needed, i.e. the signal drops by a lot and/or the noise is increasing. Because of this, there are fewer corrections needed to keep this switching out of the audio. 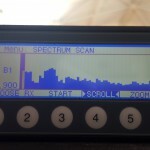 The Spectrum Scan operates as before. 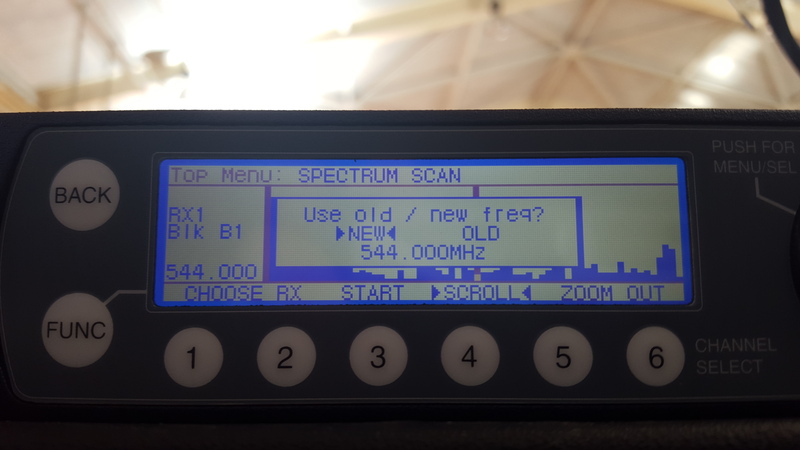 It’s scan speed has been improved quite a bit, especially considering it scans three times more of the spectrum with the new wide-band VRT2s. The SmartTune process is like that in V1. 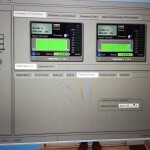 It provides a step-by-step way to set frequencies based on real world conditions. 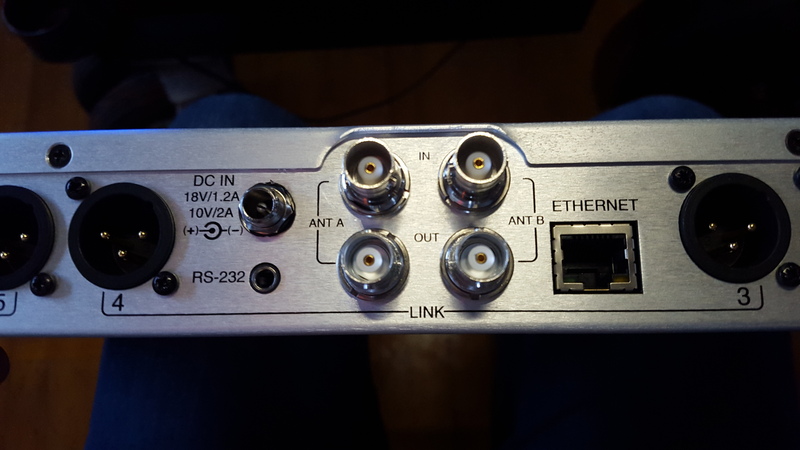 It works well for up to six channels, but any more than that will probably take longer than most people have the patience for. The new screen is 50% larger and has a much higher resolution, allowing for more information to be displayed. It is also now flush with the face of the V2. It has four settings for brightness control and sports a non-glare screen. 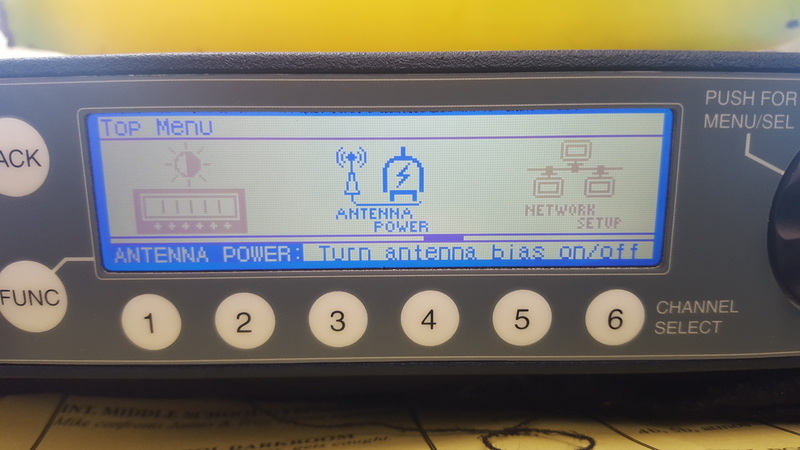 The V2 now will now report when an antenna short is detected by blinking above the hazard icon and turn off power to antennas automatically. 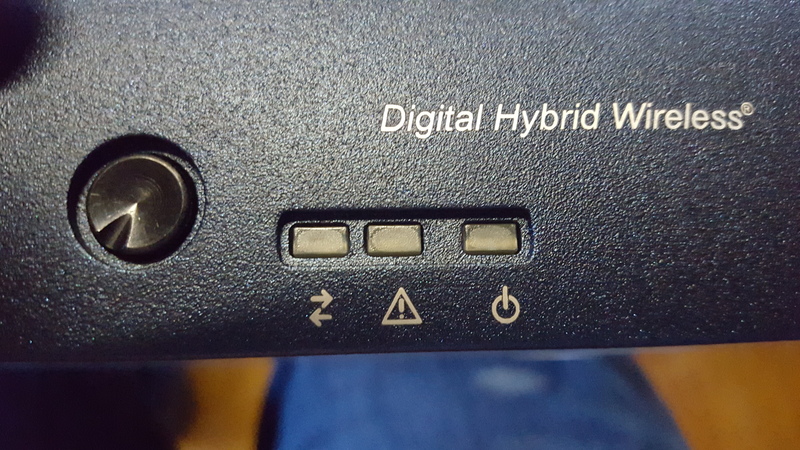 The bi-directional arrows next to the hazard symbol let you know when the V2 is connected to a computer source through the ethernet or USB connector running Wireless Designer. 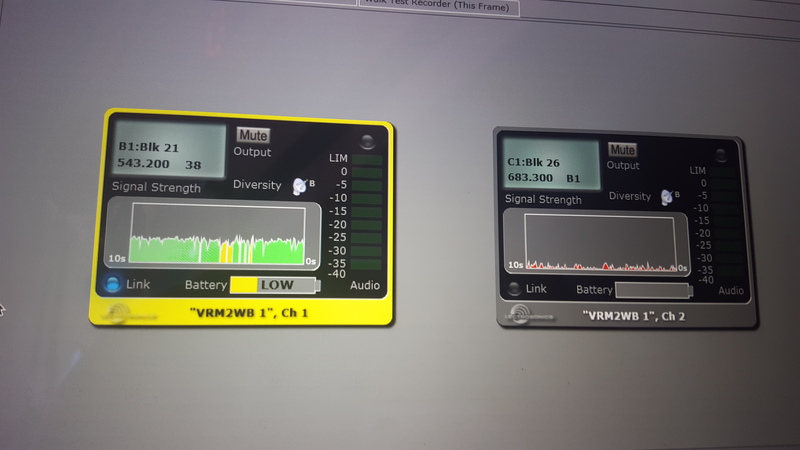 Wireless Designer is a great suite of tools that offers direct control of your V2’s functions and marries in a built-in full spectrum frequency scanner that has easy exporting ability to it’s frequency coordination program. 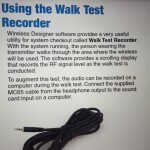 I will explore the Wireless Designer tools in more detail in the upcoming “Road Test”. 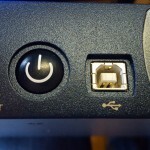 Windows users can easily direct-connect to the V2 via Wireless Designer with standard USB “B” cable. 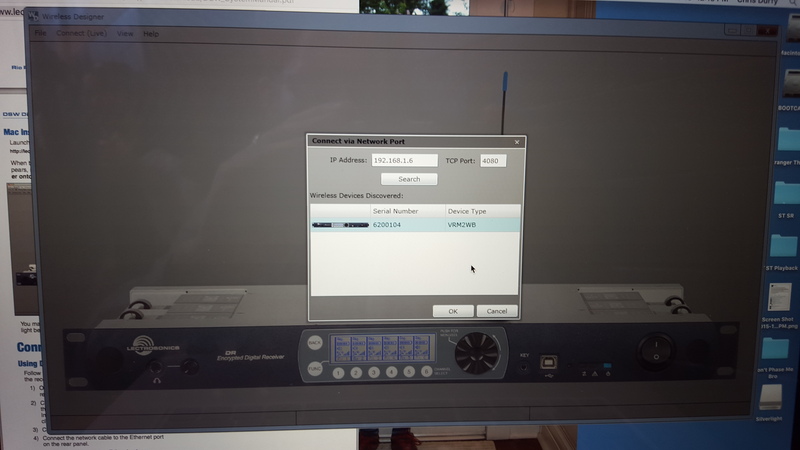 Lectrosonics is currently working on an update to allow OSX users to use the USB connector in the front. The update should be entering a beta test period soon and should be available to Mac users in the near future. 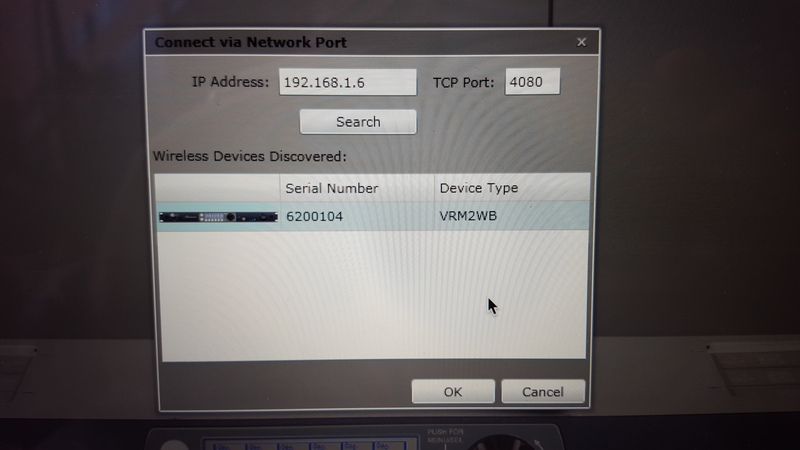 You can connect to the V2 with both Mac and PCs via Wireless Designer. 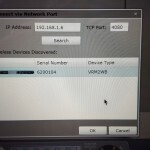 Your V2 must be wired into a router so that it is assigned it’s own I.P. address. As mentioned above, this is only way, currently, to connect a Mac to the V2. 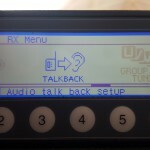 Talkback is a brand new feature built into the V2. 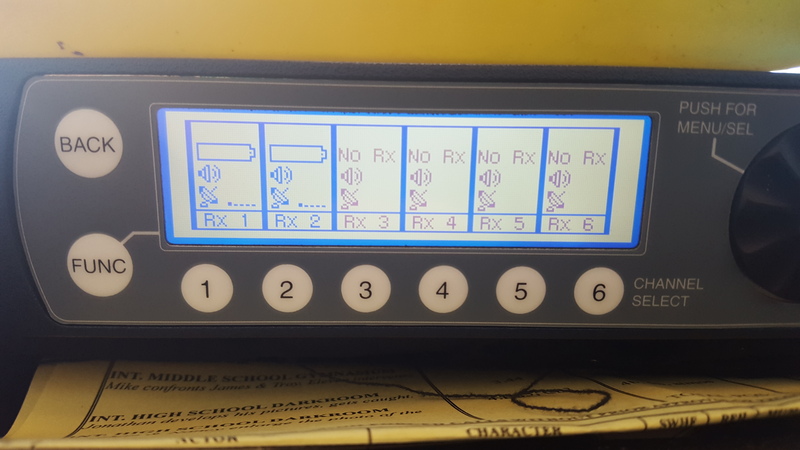 It sets up a module as a “com” channel so the person using a HH transmitter can have a direct line to the crew or production staff by depressing the button on the HH. It might come in handy for a “Voice of God” setup. 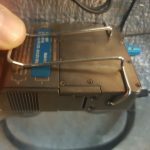 With newer transmitters that allow it, such as the LT, you can have the V2 program your settings by holding up your transmitter within a couple of feet from the IR Port. 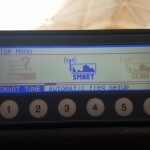 You can choose to send frequencies only, or send all settings for the transmitter. 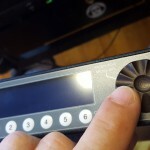 Finally, we can turn on and off phantom power without having to pull the V1 out the rack after disconnecting all cables and then using a screw driver to open the unit up and then reseting the jumper pins and then reversing the process! Now, it is as simple as a toggled setting in the V2 menu, or from a screen in Wireless Designer. 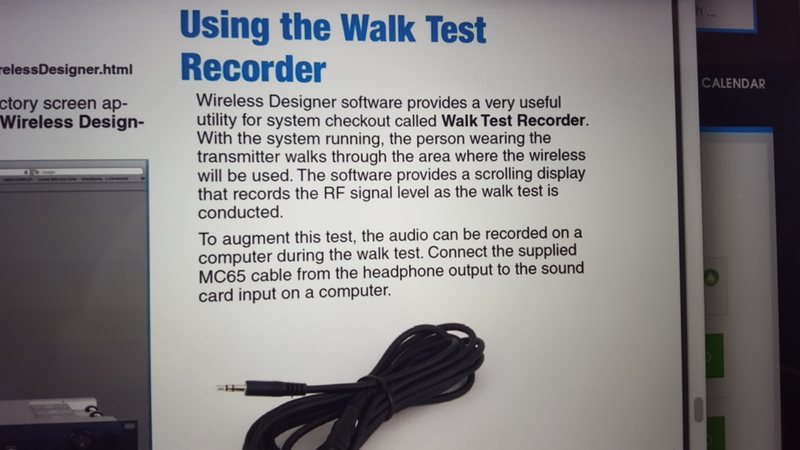 Walk Test Recorder is a utility built into Wireless Designer that records the signal strength of a transmitter during a walk test on a scrolling display. 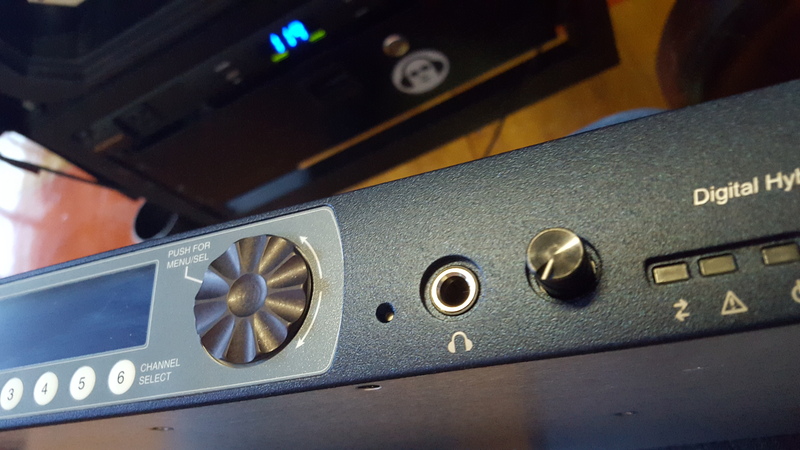 You have the option of recording the audio to the computer by using the included ¼” to 1/8” adapter. The audio will sync up to scrolling display on playback so you can visually see signal strength as it references any audio problems. Road testing: Coming up in Part II! So the Cinela Piano is currently the most talked about item when it comes to full microphone windscreens. And most often it get compared to the latest Rycote offering, the Cyclone. But why not compare it to an old industry standard? The Piano is very nice, but is it nicer than the tried-and-true Rycote WS 4. Specifically in our case; when used with a Schoeps CMIT-5U. Both offer modular wind resistance in varying degrees depending on the atmospheric conditions. Most say the Piano provides more wind resistance with a clearer sound. We haven’t tried it in hurricane-like conditions yet, but we have used it on set in tandem with a second boom mounted with the Rycote WS 4 in strong winds. So, is it better? The answer is yes… and no. Let’s break it down. Both do their jobs very well. In a rough surging wind, we compared the Rycote Windjammer to the long hair Cinela PIA-FUR-POLY-H. We engaged the hi-boost on our CMITs and both sounded very good. In the end, the Piano took the gusts a bit better than the Rycote. Having the right skins for your windscreen can make or break how well your windscreen works. 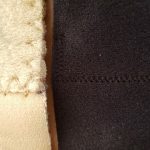 PIA-FUR-POLY-BK: same as version “H”, but with reinforced lining: Sound is audibly affected, but wind protection is really important. 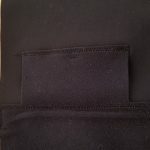 Neoprene Cover (Comes included with the Piano along with one other cover of your choice). During the testing, we didn’t have any issues with handling noise, but I also have two good operators. My intuition and from what I have heard: I would give the edge to Cinela. I will do some testing tomorrow to confirm. 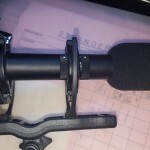 The Rycote is a straight tube with rounded ends. The lends itself to finding the sweet spot like an arrow (assuming you point it in the right direction to begin with, right?). This can be critical in situations like walk-and-talks. The Cinela’s fatter blimp shape doesn’t give you that immediate right-on-target feeling, especially on the end of a long pole. Also, the bottom of the Piano is black and pulls in the light, making it harder to see (especially at night) which makes it a bit harder to judge it’s depth of field. The Rycote WS 4 weighs a bit more. It is longer, but thinner than the Cinela. The Piano is lighter… but at the same time, it is bulkier; having a rounded shape as opposed to the straight lines of the WS 4. That being said, it feels like it is more aerodynamic, but conversely might be prone to throw a shadow in frame before the WS 4 in certain situations. 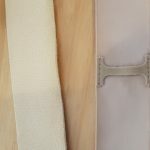 Edge: Tie, but leaning towards the Cinela. use access hole on suspension to engage/disengage filters. Rinse and Repeat in reverse order to rebuild. Edge: Cinela Piano by a nose! The Cinela’s suspension are microphone specific. You can get other suspensions if you need. On the other hand, the Rycote lyre system is a bit more versatile allowing for different mics to fit in the same suspension. I think the Cinela suspension is a bit better at isolation and that is the trade off. Edge: Rycote WS 4 is more versatile, but with a trade off in handling isolation. To compare apples/oranges, I’ll compare the costs with each kit with two skins. Now, you can get a Rycote WS 4 with a Windjammer and a Hi Wind Cover for a little over $700 from the usual suspects. 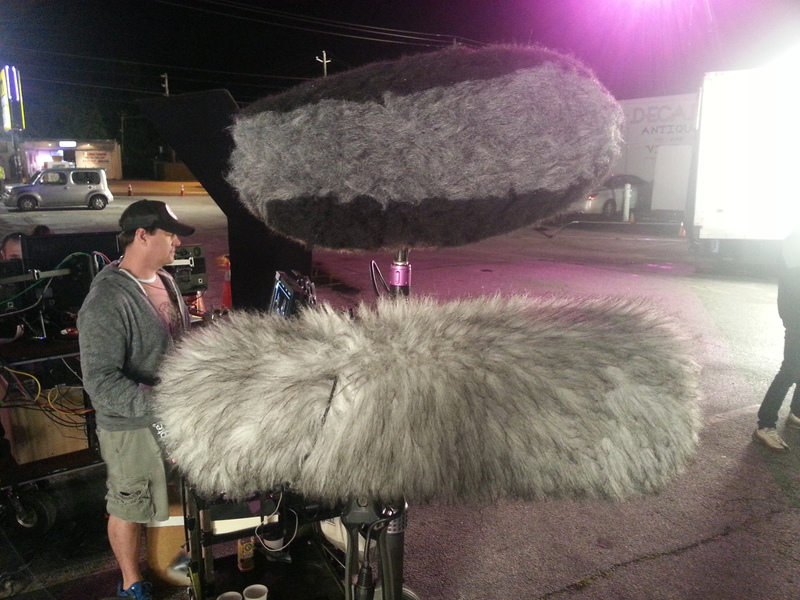 The Rycote and Cinela are both great tools with pluses and minuses. 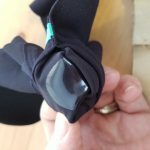 If extreme wind protection is needed, go with the Cinela. If you need to access your microphone to use it in other mounts and need to do it quickly and still have exceptional wind performance, the Rycote is your blimp! Engineer a way to open the shell quicker and easier. Also, use connectors that can’t get lost. In the meantime, please include extra grommets and bungee straps just in case! I’d also like to see the Hi Poly’s Colors reversed so the bottom is grey and the sides are black. It would help with depth of field. And black sides might help out with reflections and such. Okay, first off. I have never owned a single piece of Zaxcom gear. 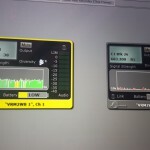 This is my first look at integrating Zaxcom into my Sound Devices / Lectrosonics “heavy” kit. 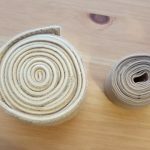 So, this review will be written from the perspective of a Zaxcom newbie. Why the TRX742.5? 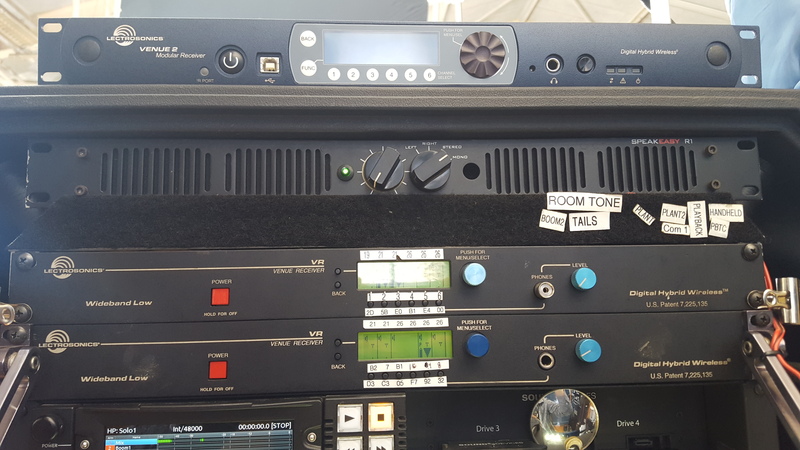 Our team really wanted to find a wireless way to quickly switch from our analog microphones to the digital AES42 powered Schoeps Super-CMIT (preserving both channels of audio from the Super-CMIT) while recording to a Sound Devices 788t. 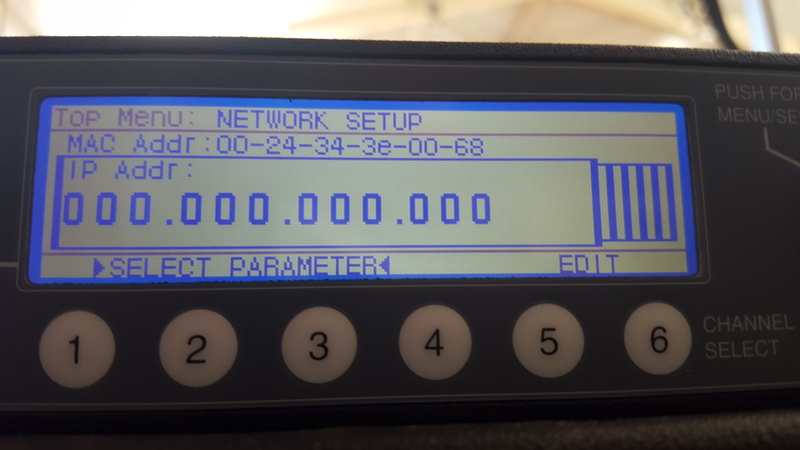 The Zaxcom TRX742 series (in our case, coupled with a Zaxcom QRX200 Receiver) is the only single solution product on the market to allow a boom operator to go wireless with a Schoeps Super-CMIT 2U while transmitting both the DSP(Digital Signal Processed) and non-DSP tracks independently and discreetly. 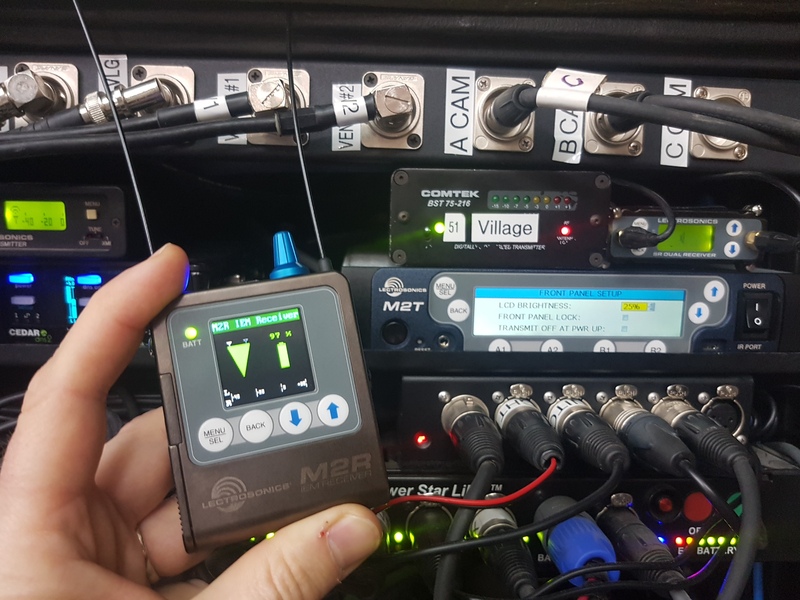 Our current analog wireless system consists of a Sound Devices MM-1 Preamp, a Lectrosonics SMQV Transmitter and a Lectrosonics R1a IFB for talkback. 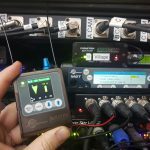 The kit is great for a wireless analog boom, but it would not work for the SuperCMIT… it lacks two channels, AES42 power and Digital transmission (or Digital to Analog conversion). That being said, much of this review will be like comparing apples to oranges, as the 742.5 crosses the boundaries compared to the other tools in our existing kit with it’s built-in multiple features. Sound Quality We did a test between two Schoeps CMIT-5Us. One with a TRX742.5 and the other with a Lectrosonics HM. To my ear, they both sounded very good. The frequency response on the low end was very subtlety different between the two, but negligible. 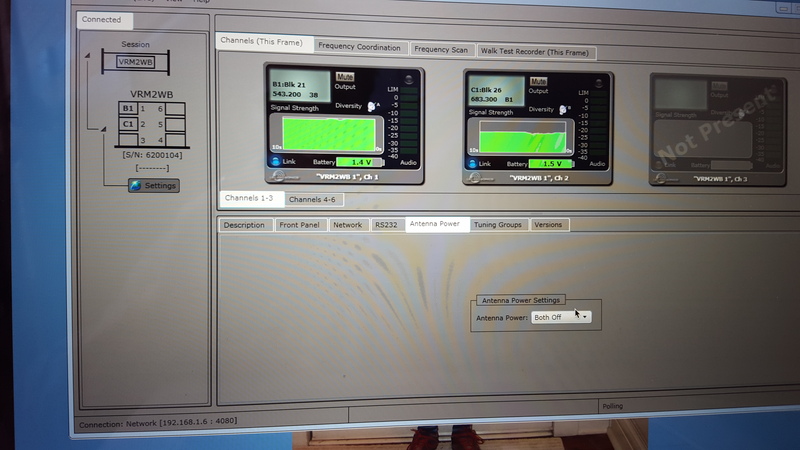 When we tested the SuperCMIT, we found both channels to also sound excellent on the TRX742.5’s two channel feed. Note: There is a “Power roll” setting that drops the power transmission level down when you are not rolling. This can be set to be triggered by one of two events: “Deva Trigger” via Zaxnet or “Record Trigger” via the REC button on the transmitter. Without a Deva, I couldn’t use the “Deva Trigger” function. 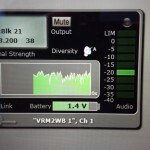 Neverclip / Limiter In analog mode, the Neverclip limiter is impressive. I whispered… it sounds great. I YELLED, it still sounds great. Good stuff! 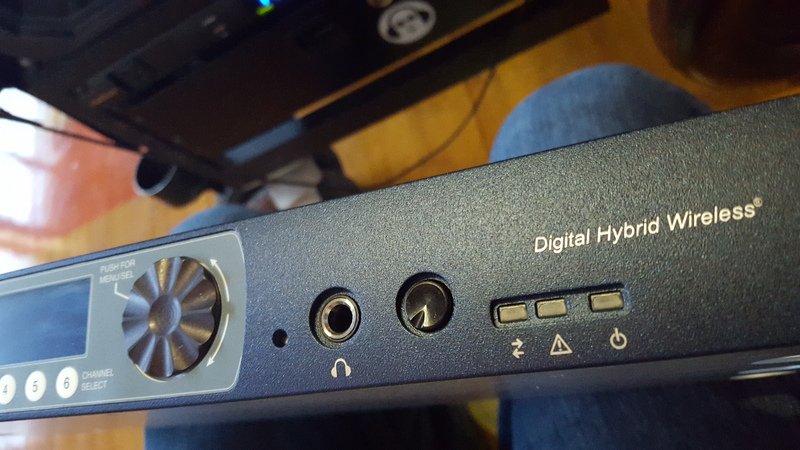 Of note, there is no digital limiter available when using AES42 mode with a digital microphone. It will clip if the maximum decibel level is hit. Interchangeable Cones for Modern Microphones The TRX742.5 has multiple cones for use with different microphones. There are four different styles: Analog, Stereo, AES & AES42. The cones come on/off with two screws. The cones I have for testing (Analog & AES42) look very much the same. Upon closer inspection, there is a hand-written note in permanent marker on the inside of each cone which designates it’s type. As with many modern audio devices, the TRX742.5 does not support T Powered Microphones. Timecode Integration w/ Non-Zaxcom Gear The 742.5 can be set to accept mic-level timecode via it’s audio input XLR while using the Analog Cone. 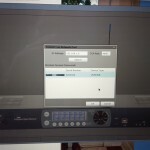 You need to set the TC Input in the Extended menu to Audio Input. (To enter the extended menu, turn the unit off, hold the menu button down while turning it back on.) If you need to jam it via your 788t or a Denecke SB box, you will need to pad the signal down by 20 dB. 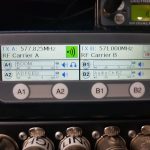 One downside for non-ZaxNet users of the TRX742.5 while using the AES42 cone, you can not jam timecode via the audio input as the TC signal is analog signal). You must use ZaxNet enabled device to jam. One option is to add an Zaxcom IFB transmitter to the kit. 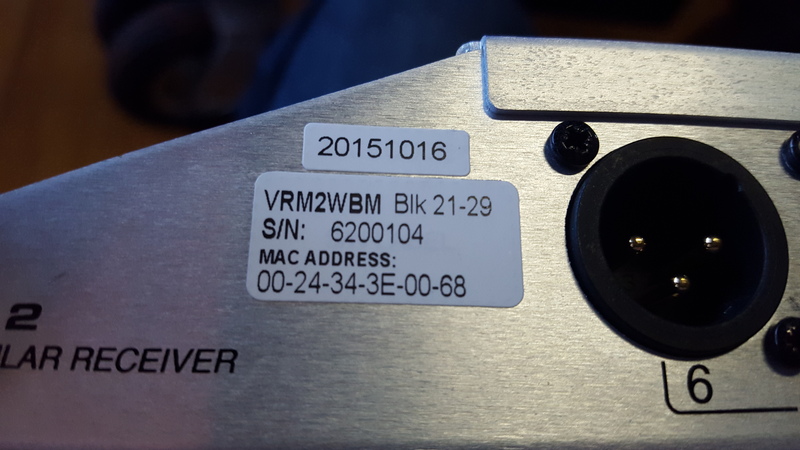 This is able to pipe timecode to the 742.5 from a 788t or other style timecode box (such as a Denecke SB-T). 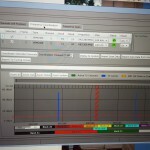 This would also add the benefit of constantly refreshing the timecode between devices. 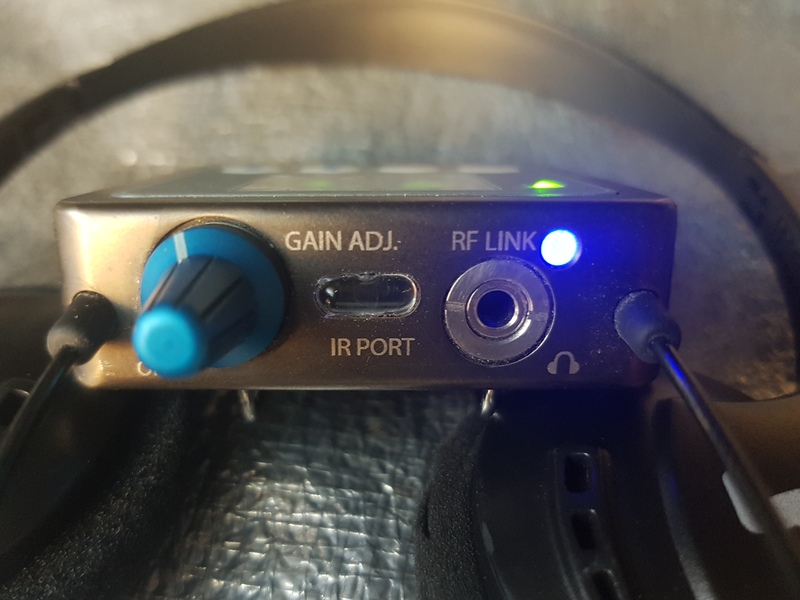 I tested an IFB200, and with some minor setup was able to get the device to jam via Zaxnet. 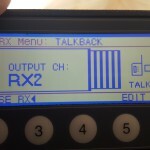 Wideband Frequency, New Frequency Modulation & Encrypted Audio Transmission One of the big differences between the 742 and the 742.5 version of the TRX is that the newer version now can operate with a much greater frequency flexibility, a.k.a. Wideband, between 512 & 698 MHz. (Blocks 20 to 26 on the Lectrosonics charts). 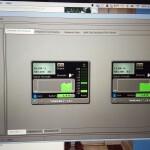 Zaxcom says their new software modulation increases the range of their transmitters. I can’t personally compare it with the older version, but I have heard from other sources that it is better. The Zaxcom signal is also encrypted from point to point between the transmitter and the receiver. Backup Recording The 742.5 has timecode stamped back-up recording abilities. It records to a format called MARF (Mobile Audio Recording Format) which is considered as a highly reliable format. 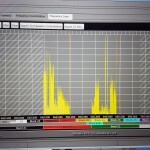 Even if power is lost, the recording will remain intact up to the point of the power loss. It does involve the need for conversion to use with some programs. 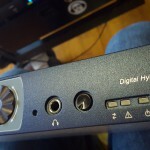 It will record both channels of a stereo microphone or an AES42 powered microphone. 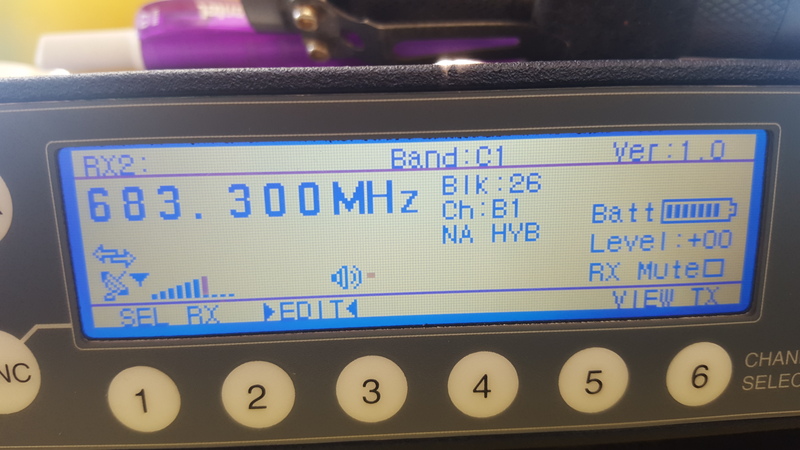 QRX200 integration w/ Lectrosonics Venue and Antenna Cables Antenna integration worked very well. 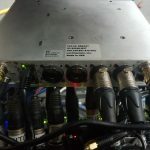 We daisy chained the antenna leads from the QRX200 into the Lectrosonics Venue with some custom SMA to BNC cables and we were able to use our existing Lectrosonics ALP600 antenna system. 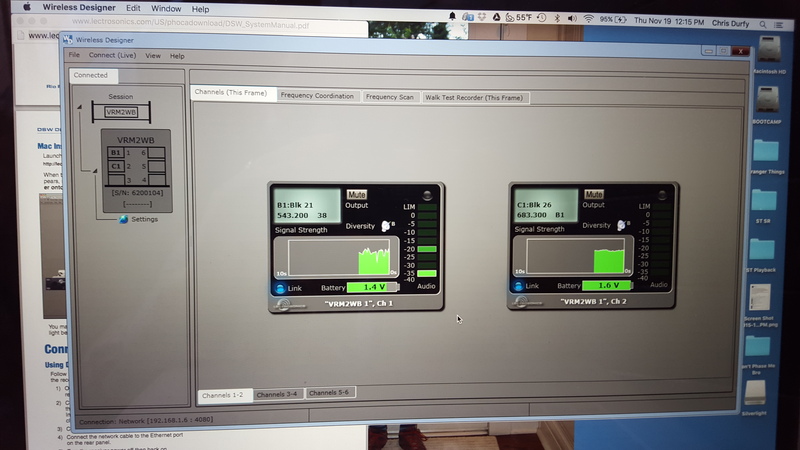 Transmission Distance We compared the digital TRX742.5 (@125 mW) with the HM (@100mW) on some range tests around the studio here. We found them to be similar with the HM giving a little better range. While the HM dropped out and was spotty… the TRX742.5 signal was gone completely. 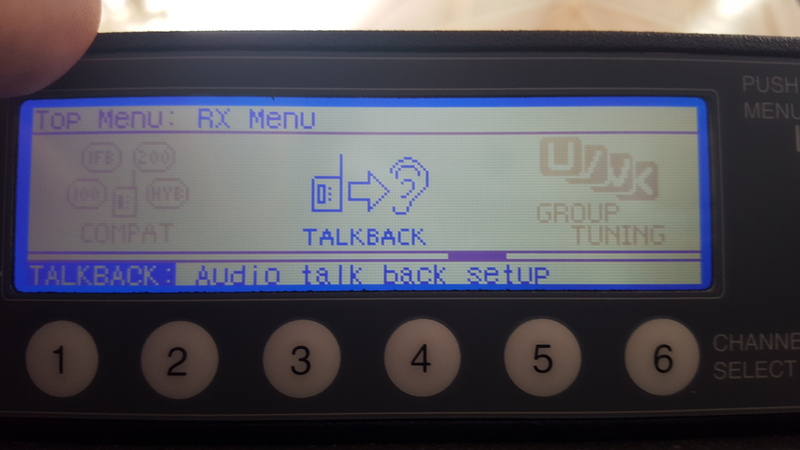 While both signals were unusable at that point, the TRX does have the backup recording option. It could certainly save the day in certain situations. This test was in and outside of the studios and was not line of sight. We also did a range walk test on the TRX742.5 between the whip antennas and the Venue/ALPs. There was definitely an increase in range using the sharkfins by about 50 to 60 feet. This also was not a clean line of sight test. The cart remained in the studio and my boom operator went outside until signal dropped out. 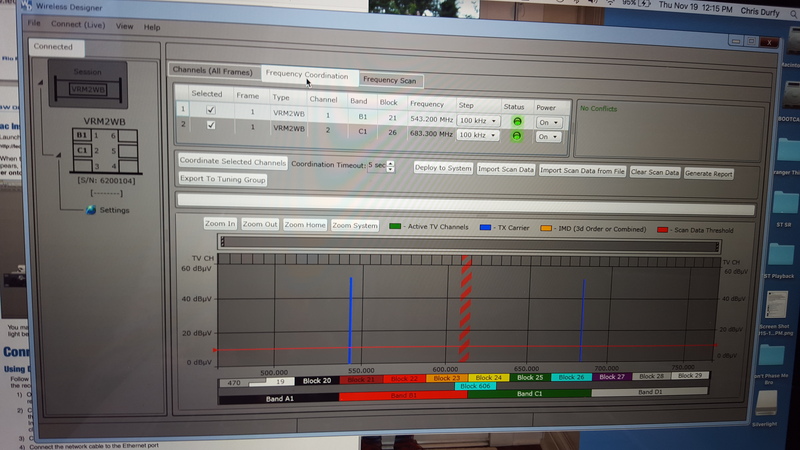 Zaxnet ZaxNet allows allows you to control levels on transmitters, passes timecode between devices automatically and other helpful and intelligent functions. Without Zaxnet, I was unable to use these functions. 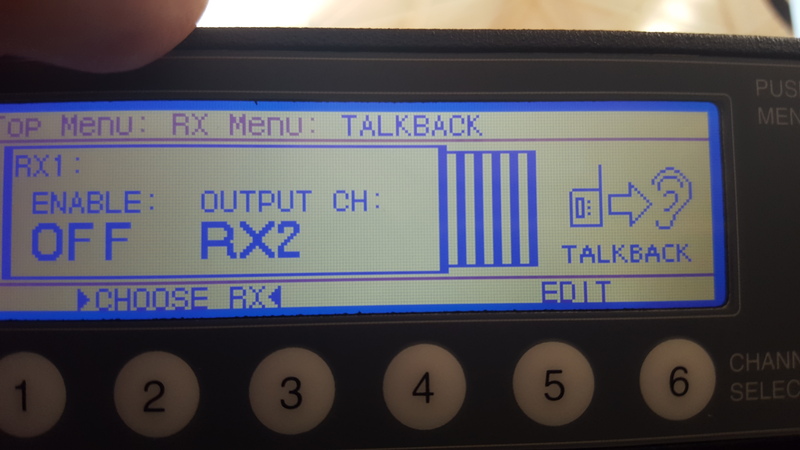 However, when I added a Zaxcom IFB200 into the workflow, I was able to pass timecode and it also allowed me to remotely control the gain on the TRX742.5. Build Quality & Form Factor The 742.5 is about ¼ to 1/3 larger than a HM, which makes sense as it has a much larger feature set. It is about 2/3 enclosed in a decent thickness metal. The battery enclosure is plastic with a flip up lid. It is held closed by three small magnets. Two screws hold the interchangeable cones. The cones each have a standard Switchcraft style lever disconnect that is protected on three sides by the metal of the cone. An SMA antenna is mounted on the bottom. 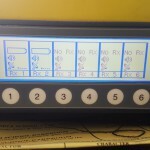 A control panel is mounted on the side with membrane style switches with a lit LED display panel. 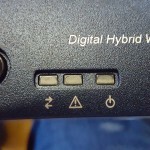 On the side above the control panel is an exposed opening for the microSD memory card. My Thoughts Honestly, the 742.5 feels solidly built. If there was a weakness, the battery door could be it. I have heard of reports that some TRX742 users tape or rubber band the door shut to be safe on scenes with quick moves to keep the door from opening up. That being said, Zaxcom has added a third magnet to help hold the door shut on the newer TRX742.5. 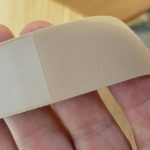 According to Glenn at Zaxcom, no 742 series plug-ons have been sent in to have their battery doors repaired because of any problems with the plastic. The power switch is small, but it is protected by the battery door. The exposed memory card slot could be an issue to introduce dust or moisture if no card is in place, so I think it would be best to keep a card in the slot when in use, even if not recording. I would have liked to see the next generation of the 742 fully enclosed in metal with a bottom-mounted battery door that also enclosed the power switch and the memory card, but according to Colleen: “You can’t do an all metal body. The reason for the nylon composite is that’s where the ZaxNet antennas are located – you can’t transmit or receive through metal!” So there you go. Price is steep… but considering all the things it does, it certainly may be economical when it is used to it’s full potential. 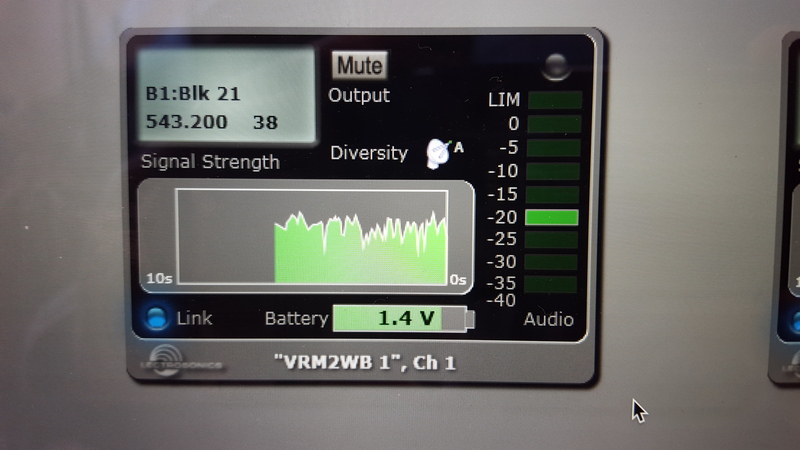 The upside for wireless SuperCMIT users is that you get both DSP & non-DSP channels discreetly and a rock solid backup recording with timecode (if using ZaxNet) via a great sounding pair of signals. Also, you get the security of a wideband frequency range which lets you know you can find a clear frequency just about anywhere. Zaxcom has packed quite a bit of power into a very small form factor, especially considering how much gear would be needed to accomplish the same feat with the current offering of the competition’s gear. Kudos to Zaxcom for bring something truly unique to the market. Special Thanks: to Colleen & Glenn at Zaxcom for making these products available for me to test and to Howy at Zaxcom for helping me through some technical hurdles on the gear. 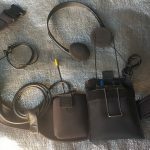 SOLD: Sound Devices 552 for sale! $1500 DEAL! I’m selling my 552 at a KILLER price. Perfect working order. Serviced recently at SD and used little since! 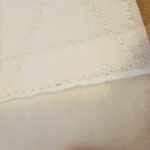 It has some scuffs on the top and bottom and one place where it is worn through the paint. All sides are in good condition! 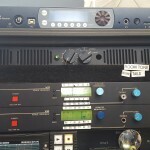 I’ll also sell a Remote Audio 25′ ENG Breakaway for $100 ($270 retail! ).